One of the predictions of Einstein's General Theory of Relativity is the existence of gravitational waves: Two large masses in orbital motion will create small, wavelike distortions in spacetime that propagate like ripples on a pond, and carry away energy. Despite big efforts and huge detectors, no gravitational waves could be measured so far. But direct discovery notwithstanding, physicists are confident that gravitational waves are real, since there is very compelling indirect evidence for their existence, and for their compliance to the rules of General Relativity. A typical source of gravitational waves would be a couple of very massive, compact stars in close orbits. Binary neutron stars are good candidates for sources of gravitational radiation. 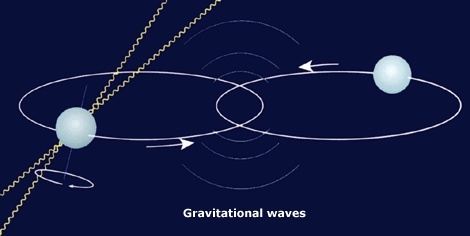 The energy oss by the emission of gravitational waves would result in a slowly decaying orbit: the stars would et ever closer the more energy would be radiated away as gravitational waves. And if one of the stars is a pulsar, there are chances that one can measure the orbit, and establish the indirect consequences of the emission of gravitational waves. That is exactly what has happend with the binary pulsar Binary Pulsar PSR 1913+16: In December 1973, astronomy student Russell A. Hulse was at the Arecibo Radio Observatory in Puerto Rico, collecting data on pulsars for his Ph.D. thesis. One of the pulsars he was observing showed a curious, periodic variation in the pulsation frequency. It soon became clear that this variation could be best understood as the periodic Doppler shift of the pulsar in an elliptic, Keplerian orbit around another star. This allowed for the very precise reconstruction of the orbit of the pulsar. The orbital parameters of this binary system, however, are so extreme - masses on the order of the Sun orbiting within eight hours at 1 permille of the speed of light at a distance on the order of the distance Earth-Moon - that Kepler's laws for the motion of two masses under the influence of gravitation are not sufficent anymore: As Hulse's advisor Joseph Taylor noted, the full-scale apparatus of General Relativity was necessary to describe the orbit, instead of the simple Newton law of gravitation, For example, the binary pulsar shows a big motion of the periastron - the equivalent of the perhelion shift of Mercury, whose share not accounted for by the perturbations of the other planets in the Solar System was explained by Einstein as the first "postdiction" of his new theory of gravitation. What's more, the time evolution of the orbit can be measured precise enough to check for the consequences of the emission of gravitational waves! The data points in figure show the observed change in time of periastron over the last 30 years, since the first data on pulsar PSR 1913+16 have been available. 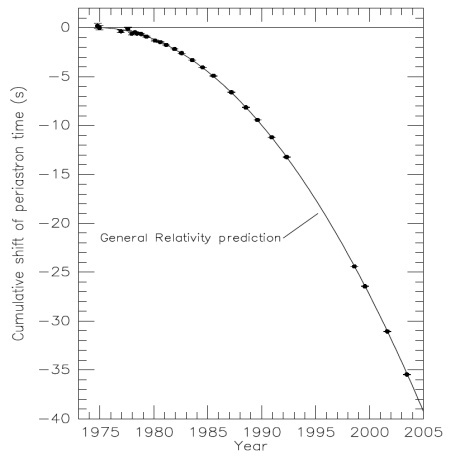 The parabola illustrates the theoretically expected change in periastron time for a system emitting gravitational radiation, according to general relativity. Not only the Nobel committee in Stockholm considered this an extremely important result - but they awared to Russell A. Hulse and Joseph H. Taylor, Jr., the Nobel Prize in Physics 1993 for the discovery of a new type of pulsar, a discovery that has opened up new possibilities for the study of gravitation. Taylor's Nobel Lecture is on Binary Pulsars and Relativistic Gravity (PDF file), while Hulse in his Nobel Lecture talks about The Discovery of the Binary Pulsar (PDF file). The Binary Pulsar PSR 1913+16 is a nice short introduction that explains in more detail how the pulsar data are analysed, and how the periastron shift can be extracted. For the latest data about the "Taylor-Hulse" binary pulsar PSR1913+16, check out Wikipedia. For two recent related rviews, see Duncan R. Lorimer: Binary and Millisecond Pulsars, Living Rev. Relativity 8, (2005), and Ingrid H. Stairs: Testing General Relativity with Pulsar Timing, Living Rev. Relativity 6, (2003). Did astrophysicists lose interest in the mid-90's? good point ;-).. Clifford Will writes in his review "The Confrontation between General Relativity and Experiment" that The gap during the middle 1990s was caused by a closure of Arecibo for upgrading, so there was no telescope observation time available. Deeply relativistic neutron star binary pulsar PSR J0737-3039A/B is another sweet case with 16.8995 deg/yr periastron advance. I was browsing Penrose's latest big opus, The Road to Reality, and saw discussion about gravitational radiation and energy. I got the impression, there is no way to assign energy to traveling gravity waves like there is in E&M radiation (E and B amplitudes squared leading to energy density.) Well, maybe there's proper justification, but: how can you get energy conservation if the radiating bodies lose energy, but there's no energy "out there" to make up the difference? And BTW, shouldn't criticisms or alternative perspectives (like what Al refers to) get some open-minded attention? I wouldn't know, just asking. I don't mind 'alternatives' and it's nice people are looking into various things etc blahblah, but given that GR works pretty damned well I'd like to see really good reason before I consider replacing it with something else. 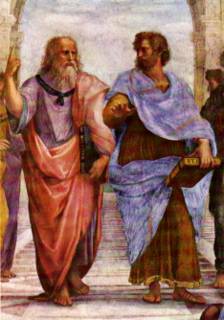 I am not sure given the search for issues concerning quantum gravity that you could ever begin the discussion without understanding the history of GR? My very first "aha moment" came to me learning to understand "some thing" is being sent out as "gravitational radiation, and what that information may tell us, as the binary star rotations become closer together. Now they have this perspective on the bulk. Looking at "quark confinement" and the metric, it did not seem detach to me, yet, it was said otherwise here at Backreaction. Now while some say the spacetime is an abstraction of geometrical proportions, I couldn't help become attached to a view of the cosmos and this bulk. How much of the energy woud be lost as heat, ie. friction on/in the stars? Thinking of tidal forces. tidal friction usually dissipates "spin" rotation energy, and the conservation of total angular momentum transfers "spin" angular momentum to orbital angular momentum, which results in an increase of the orbit, not a decrease - think of the distance to the Moon, which is increasing as a consequence of tidal friction. "Then I would feel sorry for the dear Lord. The theory is correct." I have to agree that there is no convincing evidence that GR requires an overhaul, beyond perhaps what Einstein wished as to have it become; that is a special case along with quantum mechanics within a unified theory. This off course is what many are striving to complete. Now the better question is whether we will ever find direct evidence of a graviton, as apposed to a gravitational wave? Einstein of course would have had a totally different opinion on this.